Ready to embark on your Highfive Journey? Excited about where it might take your organization? Great! To provide a little inspiration, here's a vision of what the end of your journey might look like. Get back the first 15 minutes of your meeting. Attendees no longer have to fumble through setting-up, dialing-in, and announcing themselves on the line. When you use video, you can see who is engaged and who isn't which cuts down on multitasking and the need to go over the same content later. Having conversations face to face ups the human factor in your interactions. Remote employees are able to feel like they are a part of the team all the time. This helps combat the ostracization that many remote employees feel. 93% of communication is nonverbal making face-to-face conversations more efficient. Syncing-up on a quick Highfive call can help mitigate the miscommunications common with email. A picture is worth a thousand words, especially when it comes to speaking with those outside your organization. Our customers love using Highfive to recruit new candidates, sell to prospects, and troubleshoot with current customers. Seeing the other party via video gives you much more information than a phone call would, and allows you to ID top candidates more quickly, qualify leads faster, and give your customers the best support experience possible. 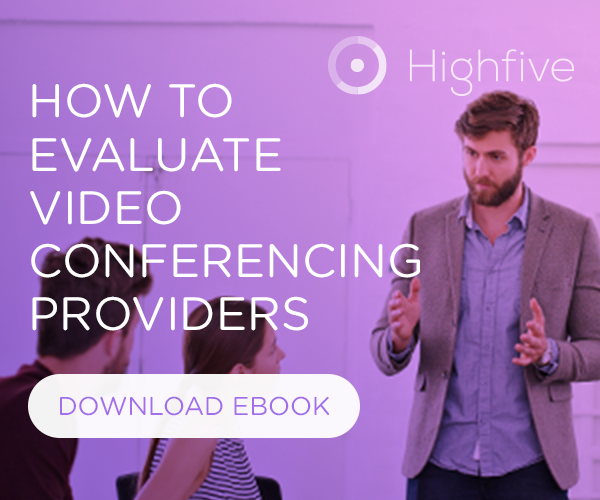 Click here to see more ways Highfive's customers are using video in their day-to-day work.